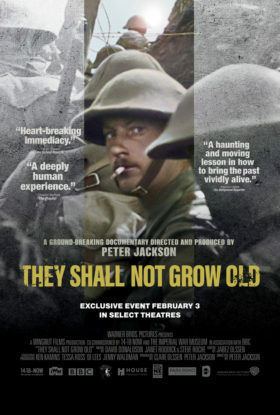 From Academy Award-winning filmmaker Peter Jackson (“The Lord of the Rings” Trilogy, “The Hobbit” Trilogy) comes the groundbreaking documentary “They Shall Not Grow Old.” Applying state-of-the-art restoration, colorization and 3D technologies to century-old footage—carefully chosen from hundreds of hours of original Great War film held in the archives of the Imperial War Museum (IWM)—Jackson has created an intensely gripping, immersive and authentic cinematic experience. The only narration comes from Great War veterans themselves, selected from more than 600 hours of BBC and IWM archive interviews, resulting in a gripping account of “The War to End All Wars,” told by the soldiers who experienced it. By restoring the original footage to a standard never seen before, the human face of WWI emerges with vivid clarity through the fog of time. Jackson captures the day-to-day experience of its soldiers and reveals the reality of war for those on the front line: their attitudes about the conflict; their camaraderie and their need for humor amidst the horror; the functions of daily life in the trenches; and what their lives were like during periods of rest. Using cutting-edge techniques to transform the images of a century ago into footage that could have been shot today, Jackson both remembers and honors a generation changed forever by a global war.